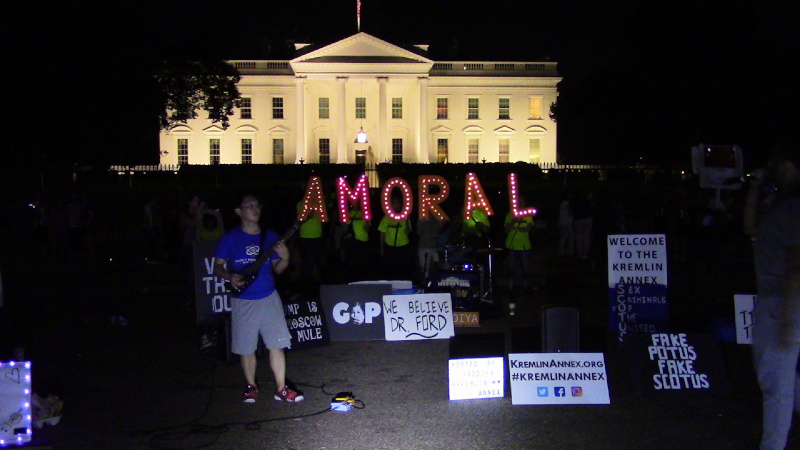 It's not over-#KremlinAnnex protest calls Kavanaugh "sexual predator"
On the 7th of October, the #KremlinAnex protests continued in front of the White House. This was the 84th evening of the protests. Again the theme was Kavanaugh's history of alcohol abuse and sexual abuse. In addition protesters made such demands as that Donald Trump show his tax returns and taunted him about how Manafort and his former attorney Cohen have already made cooperating plea bargains to inform on him. Musical and sound producing instruments at the Oct 7 protest included an electric guitar, two people with drums, and someone with a trumpet.